I wanted to publicise a company-wide event that Microsoft is running at Excel, London in the week of the 10th November and, specifically, the developer part of the event which happens on the 12th November. 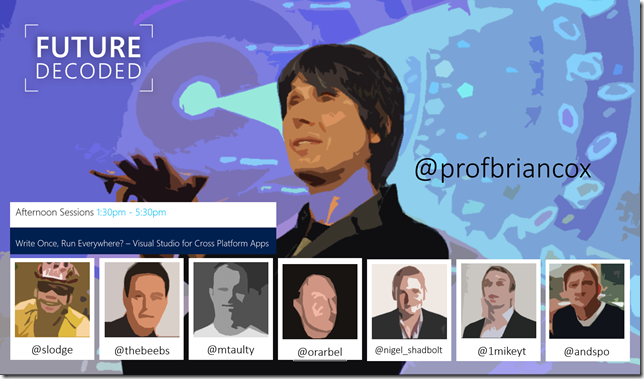 I own a half-day track on that developer day which I have themed around “Visual Studio for Cross Platform Apps” but that’s just one of many technical tracks across big data, DevOps, Enterprise Mobility, Cloud, IoT and more – it’s a big event with a big agenda and, importantly, it’s all free! “Let's take a tour of the tools offered by Xamarin within Visual Studio. We'll start from ‘File -> New Project –> Android’ and ‘File -> New Project –> iPhone’ and we'll explore what it takes to create an app – to build its business logic, to create a rich ui, and to talk to services like GeoLocation. This is a practical session – working with the Xamarin tools and looking at the developer workflow they enable. What's it feel like to code, design, debug, iterate and ship to Android and iOS from Visual Studio? “In terms of apps, Windows/Phone have been a case of "two platforms separated by a common vendor". That changed with the 8.1 release of the platforms which have been unified around the underlying WinRT APIs such that it's possible to build a significant portion of an app across Windows/Phone from common code without losing the ability to customise the app for a particular class of device. In this session we'll look at what this means for C# developers in Visual Studio by looking at the options that you have for building portable C# code that can run on both Windows and Phone and some of the considerations that you need to make when building out application code that you want to have run on both.